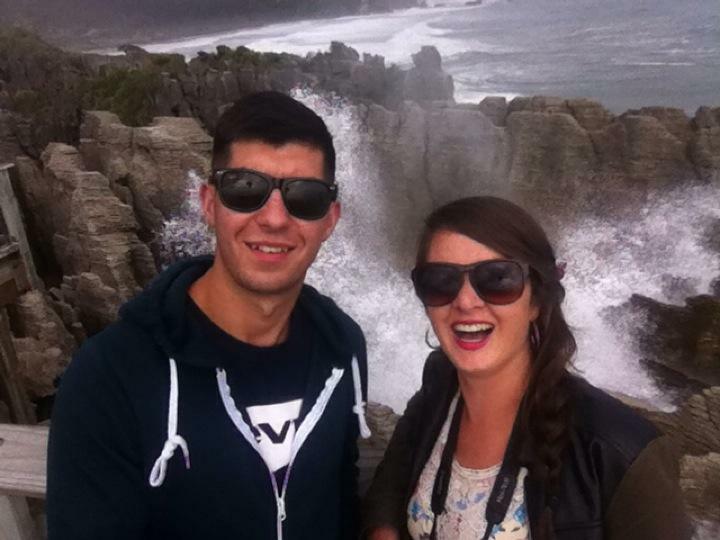 On the way to Greymouth we stopped off in Punakaiki to see the pancake rocks and blowholes. We got there just before high tide so we got to see them as the tide was getting bigger and the waves more ferocious. They were an interesting sight with the rocks shaped and layered in that way from erosion over 300 million years. We saw massive sprays of water come up through the blowholes and make booming sounds! The whole west coast (Wild West) is very rugged and rocky, with only one or two actual safe swimming beach areas. We saw great sights as we drove around the coastline on the great coast highway, which carried on past Punakaiki to Greymouth. When we got to Greymouth we had a walk around the gold mining town, which still has some of it's old buildings. It is the largest town on the west coast, but the main town centre was still only one Main Street and a couple of side streets. The old historic train station still stands and it is the last stop for the Tranz Alpine train journey from Christchurch, rated one of the best train journeys in the world. There was a large flood-wall separating the town from the Grey River. For the night we stayed at Jelliman Park, just across the bridge from the town centre in Cobden, at a beautiful free parking area overlooking the beach and sea. It is one of the best spots we have stayed in. It's just a shame that it was so cloudy or we probably would have seen a lovely sunset over the sea. The beach had loads of lovely washed up rocks (as well as it been covered in washed up driftwood) so we had a walk on the beach and went gem picking (fossicking). New Zealand's gemstone is Jade stone (pounamu) which is mainly found on the west coast and I'm sure that I found some as well as some other beautiful stones. I also got to see the rare Katabatic wind (known locally as the barber) formation sweeping from the hills, over the rugby field to the town, which can only be seen at a few locations in the world. On the 23rd we went to Shanty Town Heritage Park, just 10 minutes out of Greymouth town centre. It was a replica of an 1860s gold-mining town that had 30 historical buildings from the gold rush era such as a fire station, post office, pub, barbers, jail, shop, bank, church, butchers. We went on a steam train ride from an old rail station, got to have a look at the working steam engine and then looked around a replica sawmill, reading stories of real people. There was a timeline of information on the gold rush era as well as real life stories, which was also played out in a holographic theatre which told the story of a real murder. There was also a little gold mining Chinatown to explore. We were told to allow for 90 minutes at ShantyTown to get a good experience of it, but 5 hours later we were just leaving! We decided to stay in Greymouth again for the night as it wasn't worth travelling anywhere else. We stayed at Jelliman Park again and had lovely clear blue skies as it had been boiling all day. We saw an amazing sunset over the sea and then had a lovely starry sky to watch! Truly living the dream with these sights and they are only going to get better when we head to the alps! On the 24th we headed south down the coast to see where we would end up for night! We were still unsure of what would be next but we were heading in the direction of the glaciers and stopping at Hokitikia on the way.